We were kindly sent this article by Miss Erin, which Abra believes is one of the best written articles she has seen on the subject of abilities and expectations. We think it is a helpful article for parents and caregivers, especially with Nutcracker auditions and casting happening this month. We hope you have time to read it in the near future. We also have a copy of the article posted on a bulletin board in the ABA lobby if you would like to read it here at the studio. I find myself using a line from a dear friend of mine who also owns a studio, ‘I am so sorry your child’s abilities don’t meet your expectations.’ The point being, it is important to celebrate your child’s strengths, but to also be aware of their weaknesses and be realistic with your expectations so your child can be realistic with his or hers. I have found most young dancers know where they are in the scheme of things even if their parent might not. This can make the young dancer take their parent’s disappointment very personally and can lead to feelings of inadequacy which ultimately stunts their improvement. I was in the room one day when a child timidly came up to another teacher and told the teacher that her mother thought it was time for her to move up a level. Was this a bit harsh? Maybe, but the parent ultimately put their child and the teacher in this situation. Have them pursue summer study, preferably away from their home studio when they get older. Encourage them to try classes in different genres of dance to help develop skills that are lacking. For instance, tap is great for developing musicality, jazz and modern are great if your child lacks physical strength or attack, and ballet is best for developing overall technique. This article about Dance Discipline is from a dance blog written by Theresa A. Velardi, certified to teach Classical Ballet (Cecchetti method) and Tap through Dance Masters of America teacher, Dance Educators of America and Associated Dance Teachers of New Jersey. Discipline in ballet class simply means learning, practicing and demonstrating expected behaviors specifically associated with ballet. From the dancers’ viewpoint, discipline comes from the desire to meet and obtain the desired results in class, that is, learning and perfecting the steps taught. 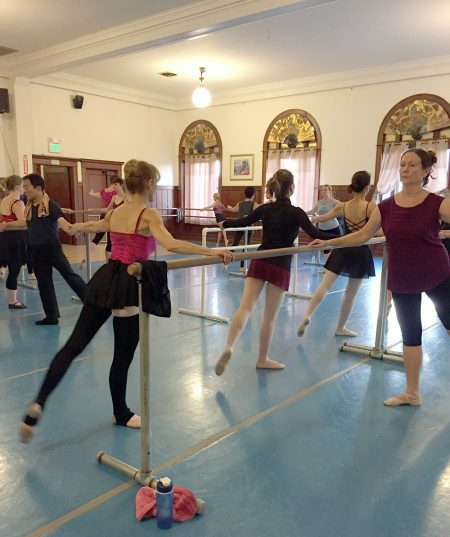 Taking ballet class develops self discipline of the body as well as critical thinking skills. Practicing ballet physically changes the body by teaching it a way to communicate through the choreographed movements, we call steps. Dancers, executing the required barre, center and across the floor dance combinations, requires them to focus on the exercises and combinations in logical, orderly phrases, that create a sequence. Those phrases relate to the accompanying music. The dancer requires self discipline to meet the standards of ballet. Sometimes, learning to commit to the study of ballet, dancers increase self discipline and abilities which may have a positive effect on learning in other areas of their lives. The ballet teacher views discipline as a commitment to practicing the steps taught as well as structure, rules and etiquette of the ballet class. Discipline in the ballet classroom connects dancers to the history of ballet that dates back to the courts of the Renaissance period and the formal traditions that have become ballet classroom heritage The connection to tradition results in combining performance with an appreciation of the beauty of ballet. Dance students need to understand that becoming a dancer requires accepting feed back from the teacher. Too often, teacher feed back is received by the dancer incorrectly. Dancers who are Teens, high school students, especially, believe that the teacher may be there to make their life more difficult, and take correction personally. The teacher, while applying discipline to her class is only applying discipline as a whole. One area is class attire. The dancer’s and teacher’s attire for class contribute to professionalism and class atmosphere. The school director decides how stringent classroom attire should be to obtain professionalism. Today there are too many dance catalogs on the market and online dance stores in which the manufacturers believe how dance students should dress for class. It is not up the manufacturer of these garments to dictate what the dancers need and need not wear. It is up to the teacher of the class to promote professionalism within the classroom. Class attire is a discipline that is important for me as a teacher. Unity in class attire gives the dancers a piece of history as well as an ease of eye, for the teacher, while she looks at her class in the mirror. With class unity, it is easy for the teacher to identify any mistakes or dancers who are out of place. Confusion comes from seeing too many colors, styles and forms of dancewear in the mirror. Hair needs to be confined and off the neck. Bangs and short hair need to be confined. No hair should be swinging at any time. It creates a distraction to the dancer as well looks sloppy in class. Another area of discipline is class behavior. During class, dancers are expected to be quiet while the teacher gives the instructions for combinations, or offers a correction. Talking in class to your classmates, should be prohibited. If the dancer has question, then she should raise her hand and wait to be acknowledged by the teacher to ask her question. Obviously gum chewing is unsafe and unsightly in the class and also distracts the dancers concentration. Jewelry should be absent. Small post earring are not a hazard or distraction and may be worn, but dangling earrings create not only a hazard for the dancer but a distraction for the teacher. Classroom behavior also involves courteousness towards other dancers as well as respect for authority…the teacher. Cell phones, which are a distraction, need to remain off and tucked away and never checked during class time. This is not only a distraction to concentration for the dancer but rude to the class and mostly to the teacher. Discipline in ballet is a way of life, a good way to learn to lead your life outside of the dance room. Self discipline will follow your for the rest of your life and your beginning is in the ballet classroom. Here’s a an article in the October 2009 issue of Dance Magazine about a sensitive subject in the ballet world by Nancy Wozny. Maintaining a healthy physique—not too heavy but not dangerously thin—is a reality of going pro as a dancer, and helping students commit to that ideal is one of a teacher’s many jobs. “A physically toned and sculpted body is a part of a dancer’s package, just like turnout, extension, and elevation,” says Rozow, now chair of the dance program at Cincinnati’s School for the Creative and Performing Arts. But the subject of losing (or gaining) weight to achieve that aesthetic can be extremely sensitive, particularly during the emotional minefield of the teen years, when the body is in flux and body image more vulnerable than ever. So what’s the best way to talk to students about their weight, without causing undue emotional, psychological, or physical harm?Dance Magazine spoke with school directors across the country to find out. Once she has decided to meet with a student, Tracey chooses her language carefully. She steers clear of the words “weight” or “fat” and never mentions a specific number of pounds to be gained or lost. Instead, she frames the conversation around being in the best shape possible. “I talk about dance being a visual art. You will be presenting yourself, so let’s figure out how you can be at your best,” she says. “And I never draw comparisons to other dancers. That can be very destructive.” Similarly, Power focuses on “physicality” (rather than “weight”) as “part of a larger set of requirements” for a dance career. She stresses the demands of partnering, and the aesthetic preferences of different choreographers, as reasons to stay fit. “It’s not just about getting skinny,” she says. Helping dancers reach an acceptable weight means educating them about nutrition. Both Tracey and Power arrange for students who need assistance to work one on one with a nutritionist. “They learn to keep a food journal and receive an individualized eating plan, while not entirely giving up their favorite foods,” says Power. “What we give them isn’t a diet but a life-long strategy for health.” At Boston Ballet and Houston Ballet, group nutrition classes are also a regular offering for all students. Staying in shape does not mean wasting away. A too-thin dancer requires immediate attention due to the long-term risks of eating disorders. “My alarm bells ring louder in this potentially dangerous situation,” says Tracey. “A dancer needs to know that their health is more important than being in class. We don’t take it lightly, and require a doctor’s note to return.” When Jefferson has concerns about a student rapidly losing weight, she either asks permission to call their parents, or, if less urgent, places them in a wellness workshop with Linda Hamilton, Dance Magazine advice columnist. Nancy Wozny writes about the arts and health in Houston. Click here for a link to the original article.